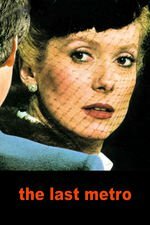 In Truffaut's 1980 film, an actress married to a Jewish theater owner must keep him hidden from the Nazis while doing both of their jobs. I apologize this thread is going up after the free streaming period is over. Criterion's blog is pretty opaque about when these movies are actually free...it appears to be Friday to Friday, but this set of films weren't even announced until Sunday. The new films for the upcoming week were announced today, however, so you'll be able to vote on them here as soon as I get the new survey up. I just got around to watching this, and I normally like to give things a little while to sink in before I talk about them, but what the hell? I really liked the 'play within a [movie]' format, and the stagelike film elements. Kind of the opposite of realism. The whole thing looked like a play, which added to the melding of the stories. The story just sort of creeps up on you. The oppressive environment, the Nazis just off screen and around the edges, and the various bigotries creeping in to everyday situations, like after Marion walks in on the two women kissing and the implications of homophobia, and Raymond's "I'm not a nice fat man! I'm a mean fat man!" It all contributes to a general sense of paranoia and oppression that makes it tough to get a read on anything, but mostly Bernard. He's creepy from the outset, but he says some of the right things sometimes, so I was never really sure about him, not even in the end. And maybe I'm imagining this, but the final scene looked like a straight up fantasy. Like a dream sequence or something. The story is very uncomfortable, but damn if this picture isn't beautiful. So warm and natural but still crisp. Not to mention the shadows! Anybody can film a fully-lit scene. It takes someone special to capture shadows the way Truffaut does here. I do wonder if they're meant to be symbolic, or are just a result of the natural style the movie is filmed in?